Soon it will be spring break at UMass Amherst and, although it is still only February, the weather is milder and the days longer and quite pleasant in Massachusetts. Rather than jetting somewhere warm during spring break for a nice holiday, like some of my students, most certainly, will be doing, I will be in England (and I hope that the "beast from the east" has left by then and, along with it, the snow and cold). Last summer I received an invitation to teach a masterclass in England at Lancaster University and was able to arrange my masterclass, which is on Network Equilibrium, to coincide with my spring break. The masterclass consists of about 8 hours worth of lectures and will be given to Master's and PhD students in Operational (Operations Research) and Statistics. I was invited by Distinguished Professor of Operational Research Dr. Kevin Glazebrook and was honored and delighted that I could accept the invitation. I have been enjoying preparing my lectures and am very much looking forward to meeting students there and also seeing numerous fabulous colleagues in my field. STOR-i is the centre hosting my visit. I will be covering theory as well as numerous exciting applications in my masterclass! The first time that I taught outside of the United States was back in 1996 when I received a Distinguished Visiting Professorship at KTH (the Royal Institute of Technology) in Stockholm, Sweden. One of the goals of that program was to increase the visibility of female academics. So, with family in tow, off we went to live in Sweden. I thoroughly enjoyed having offices both in Systems Theory and Optimization and in Regional Planning. To get from one office to the other I hiked through the woods and crossed a river. I sometimes (actually, often) wondered what my daughter was doing in a Swedish daghes (daycare) while I taught a course and she dined on salmon and dilled potatoes and also learned how to climb trees and cliffs at a very young age! The 6 months we spent in Sweden were magical and I enjoyed teaching a class in optimization and networks. We returned to Stockholm, and lived at the Wenner Gren Centre, for extended periods multiple times. When an opportunity presented itself to be a Visiting Professor at the School of Business, Economics and Law at the University of Gothenburg (the second largest city in Sweden), I took it and in the last several years have had multiple visits there. I treasure my colleagues around the globe and the richness of the cultural experiences (plus food). In 2002, I had a dream come true (my mother, who was a WW II refugee, always told me that if I had a chance to go to Innsbruck, Austria, that I should). I was offered a Distinguished Chaired Fulbright at SOWI at the University of Innsbruck, and, again, my family accompanied me since I not only did research (and elementary school children only go to school there for a few hours a day), but also taught a slew of courses. The first time that the SOWI students hammered on their desks after a lecture of mine with their fists, I was wondering what I had done wrong. This is actually a sign that they enjoyed my lecture very much! Tina Wakolbinger, who was one of my students there, graduated, worked for a year in Austria, and then became my doctoral student at the Isenberg School of Management. She received her PhD in 2007, achieved Full Professor status in only 4 years and is now at the Vienna University of Economics and Business in Austria as a Professor of Supply Chain Services and Networks and Head of the Research Institute of Supply Chain Management. Clearly, a big success story, and also an example of what can happen if you stretch your boundaries and teach in another country. Tina invited me a few years ago to teach at her university, and I instructed an intense course on Humanitarian Logistics. A student in that course is now one of Tina's doctoral students. From Sweden to Austria to Sweden and Austria and now soon off to England to teach and to acquire experiences that I share with my students back in the US! Today the students in my Humanitarian Logistics and Healthcare class at the Isenberg School had the great honor and privilege of hearing from a consummate professional and practitioner - Mr. Patrick Carnevale of MEMA (Massachusetts Emergency Management Agency). Mr. Carnevale presented a guest lecture in my class entitled, Puerto Rico 2017: Hurricanes Irma and Maria. He spoke about the weeks that he spent there in October assisting in the extremely challenging response. The talk by Mr. Carnevale this morning was really touching and inspirational. It is not often that one encounters people like him who take pride in the work they do and are so emotionally attached because they care so much about the well-being of the less fortunate. As an international student at UMass, since my first day, I have seen the country go through a major transformation (for the worse), but hearing Patrick today restores some faith in the good people that we are surrounded by and shows that there is some hope for the country as long as we have people like him working for us! Mr. Carnevale has worked for MEMA for 17 years and he said that the hurricanes hitting Puerto Rico was the "most difficult" disaster to be part of. He worked 7 days a week there, 14 hours a day, and slept on an Italian cruise ship (don't ask him about the food or accommodations, a photo of the latter he shared with us), which was housing 2,500 of the responders. Puerto Rico in September had 3.4 million people and the temperature there was about 84 degrees with high humidity. The rainy season is April to November so the responders also had to deal with that. There are now 35,000 Puerto Ricans leaving the island monthly with the highest number of families now living in Massachusetts with additional challenges because of the housing stock and schools. 46% of the people in Puerto Rico lived in poverty even before the multiple hurricane strike. Moreover, the infrastructure already was subpar from the electric power networks to the roads and bridges. Mr. Carnevale told us how the San Juan Convention Center was taken over by the federal government and served as a joint field office.. Although he stated that the coordination was OK, he found the bureaucratic forms and paperwork very much slowed down the delivery of the supplies, assuming that you could even find the contacts. He said that it took 3 days to schedule a mission because of this. In the field there were 1,500 representatives from the military, Homeland Security, VOADS, and urban search and rescue folks, and he was also in the field. His mission was to lead the central island coordination task force. MEMA was the second group on-site and he mentioned that the military had 180 helicopters, with the big ones able to carry 6 pallets of goods. There were many isolated communities to which trucks could not deliver baby supplies, food, water, and medicines. He spoke of a very useful federal app, known as MAGE, that was helpful in mapping route disruptions, destroyed bridges, etc. His mission coordinated 587 flights and 32 ground trips. The challenges the responders faced were immense and included challenges in communications: dealing with language barriers, limited cell phone services, and sporadic functioning of satellite phones because of congestion. Additional challenges were the constantly changing environmental conditions with new landslides and bridge outages. He shared with us experiences and insights that you do not read about in the media and that were incredibly eye-opening! He also spoke of the successes from relationship building to the delivery of supplies. ATM machines were not functioning so many responders carried cash and Mr. Carnevale also took part in "extraordinary examples of altruism" as my student so brilliantly wrote after hearing him speak today. We thank Mr. Patrick Carnevale from the bottom of our hearts for his extraordinary work and that of his team and for his great humanity and for sharing his experiences and wisdom with us today. He is a true Humanitarian Hero! And this afternoon, he was in Boston meeting with the Governor and Lt. Governor. Yesterday, Professor Hari Balasubramanian of the Mechanical and Industrial Engineering Department at UMass Amherst kicked off our Spring 2018 UMass Amherst INFORMS Speaker Series. 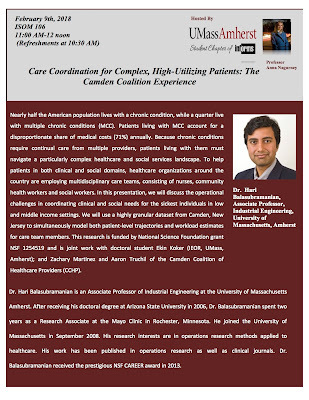 His lecture: Care Coordination for Complex, High-Utilizing Patients: The Camden Coalition Experience was brilliant. The announcement for his talk even made the UMass Amherst homepage! The UMass Amherst INFORMS Student Chapter President, Deniz Besik, introduced him, although to many he did not need an introduction given his renown as an educator and also as a researcher, having received an NSF CAREER Award. Before joining the faculty at UMass Amherst in 2008, Dr. Balasubramanian spent two years as a postdoc at the Mayo Clinic in Minnesota. Dr. Balasubramanian began his talk with excellent motivation including that he first became familiar with the Camden Coalition project through a video report by Dr. Atul Gawande (I am a huge fan of his books) on doctor hotspots, which is a must see. Dr. Balasubramanian contacted the Coalition and then began working with them and using what is being called the most detailed dataset in healthcare. The data is granular, time data. He shared with us that 1% of the top "spending" patients account for 25-30% of the total costs. There is a very skewed structure - a minority of the patients experience multiple hospitalizations - higher hospitalizations account for higher costs. He spoke about patients being on 17 different medicines and how the outcome for many of these patients does not improve. Some of this is due to poor coordination of care and after care. Their care is fragmented and there had not been enough studies done on the associated time effort. Dr. Balasubramanian's lecture was in three parts: patient trajectories, learning and prediction, and workload and staffing (perfect for operations research to address via queuing and capacity planning). The Camden Coalition consists of nurses as well as social workers and community health workers. The dataset has data on 531 patients and 331 have "graduated" from this program. The patient's trajectory begins when the patient agrees to an "intervention" and the trajectories are also mapped and time stamped (with icons that were very effective). A patient "graduates" when he/she is "self-reliant". 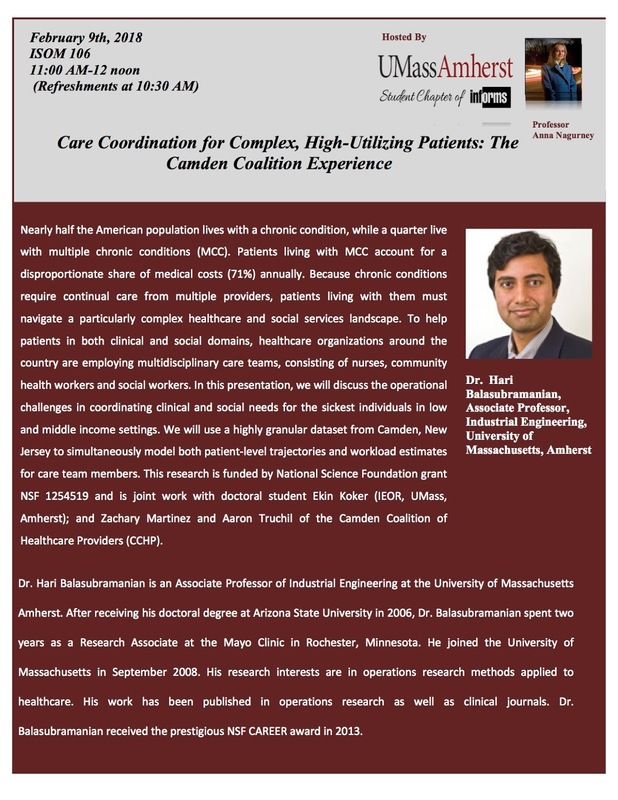 Dr. Balasubramanian detailed numerous research questions, such as what are the links between workload of the providers and the high-utilizing care patient outcomes. He also described some of the approaches to investigation, including the use of machine learning, and decision trees and random forests (which generated a lot of questions from the audience), and, of course, beautiful classical and advanced queuing theory! 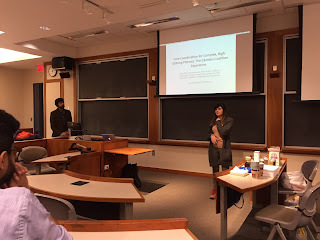 The work is with partners at the Camden Coalition and his doctoral student, Ekin Koker, a very active UMass Amherst INFORMS Student Chapter member and former Webmaster! His talk was an exemplar of Doing Good with Great Operations Research. He is also working now in Holyoke, Massachusetts, which has some of the healthcare shortcomings as Camden had and still has. We had a lovely lunch at the UMass Amherst University Club after his lecture. To celebrate his great talk the group of six shared four desserts, including the one below. Afterwards, Dr. Balasubramanian was interviewed in the Supernetworks Lab at the Isenberg School for a video that the chapter will be positing on its youtube channel soon, a fabulous initiative begun this year. See the interview with Dr. Renata Konrad by Deniz Besik here. Also, see the interview with Dr. Dmytro Matsypura by Pritha Dutta. A HUGE thanks to Professor Balsubramanian for all his time and efforts for speaking to us and from the great work that he and his team are doing in Operations Research and Healthcare! The life of an academic is never dull and what I especially enjoy is the good news that arrives! Last night I heard from my 16th PhD student, Dr. Min Yu, who received her PhD from UMass Amherst in 2012, with a concentration in Management Science, that she had been awarded promotion to Associate Professor and tenure at the Pamplin School of Business at the University of Portland in beautiful Oregon. This is a big milestone and we are all thrilled for her! Dr. Yu was not only my PhD student (I have chaired 20 PhD dissertations to completion) but we continue to collaborate on a variety of supply chain network problems from food to sustainability. And just this past week, with a present doctoral student of mine, Deniz Besik, we completed a paper, "Dynamics of Quality as a Strategic Variable in Complex Food Supply Chain Network Competition: The Case of Fresh Produce," and submitted it to a special issue of a journal (and we met the deadline). This paper we will be presenting at the NEDSI conference in Providence, Rhode Island (I have a soft spot for this city since I have 4 degrees from Brown University) and it is beautiful there in April. Another doctoral student of mine, Pritha Dutta, will also present at this conference and the title of that paper is: "Supply Chain Network Competition Among Blood Service Organizations: A Generalized Nash Equilibrium Framework." Last week I had the pleasure of being interviewed for a radio segment by Karen Brown: 'Critical' Blood Shortage Comes Down To Weather, Flu And Supply Chain, which aired on NEPR and several other state public radio stations. It is gratifying when research that one does can impact practice. We received a contract from Springer to edit the volume: Dynamics of Disasters: Algorithmic Approaches and Applications, which is shaping up nicely with multiple papers now in the revised, accepted, or being reviewed stages. I am co-editing this volume (as I did the one published in 2016) with Professors Ilias S. Kotsireas and Panos M. Pardalos and my co-authors and I have revised our paper, A Variational Equilibrium Network Framework for Humanitarian Organizations in Disaster Relief: Effective Product Delivery Under Competition for Financial Funds, Anna Nagurney, Patrizia Daniele, Emilio Alvarez Flores, Valeria Caruso, and it is now accepted. 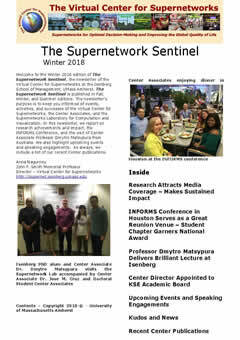 This week we published the 2018 Winter edition of The Supernetwork Sentinel, which is the newsletter of the Supernetwork Center at the Isenberg School that I founded in 2001 and continue to direct. This newsletter, as well as all previous ones, can be downloaded here. It is amazing, if I may say so, what the Supernetwork Team accomplished in the past few months and all the wonderful activities and events on the horizon! This week we also heard that Dr. Burcu Balcik, renowned in humanitarian logistics, will be coming to speak in our UMass Amherst INFORMS Speaker Series on March 30, and we are thrilled and delighted. Our first speaker will be Professor Hari Balasubramanian, who will speak on February 9, followed by Professor Jim Orlin of MIT on February 23, Dr. Les Servi on March 23, and Dr. Davit Khachatryan on April 20! On several of the "remaining" Fridays I will be giving talks at WPI, in Italy, Switzerland, and Wisconsin. Plus, I am teaching my Humanitarian Logistics and Healthcare class this semester and I am also hosting multiple Guest Speakers as Professor for a Day! Today, we had Mr. Jeff Hescock, who is the UMass Interim Executive Director of Environmental Health & Safety plus the Director of Emergency Management and Business Continuity, speak and he was amazing! Below is a photo taken after his lecture. In this class will have also other guest speakers (the response to my invitations has been tremendous and I am so grateful) who have worked for (or are presently employed by) MEMA, BayStateHealth, Doctors without Borders, and UMass Amherst, and additional speakers on Disaster Communications and other topics. And, this week, I was honored to again assume the position of being the PhD Coordinator for Management Science at the Isenberg School, a position that I held for over a decade. I thank my colleague, Professor Ahmed Ghoniem, for his excellent service in his capacity as the Coordinator for the past few years. Doctoral students are essential to the vibrancy and intellectual energy and productivity of a great research university such as UMass Amherst! We have also been very busy working on a big proposal to the National Science Foundation on a truly exciting, multidisciplinary project and it is super to also be part of this team.